Wedding is a memorable occasion and you would want everything related to your wedding perfect. We all want the best looking wedding dress, decoration, arrangements and food for our wedding, so that they remain etched in our memories. The one big aspect of a wedding is the wedding cake and you would surely want the wedding cake to be incredible in terms of flavor and style. 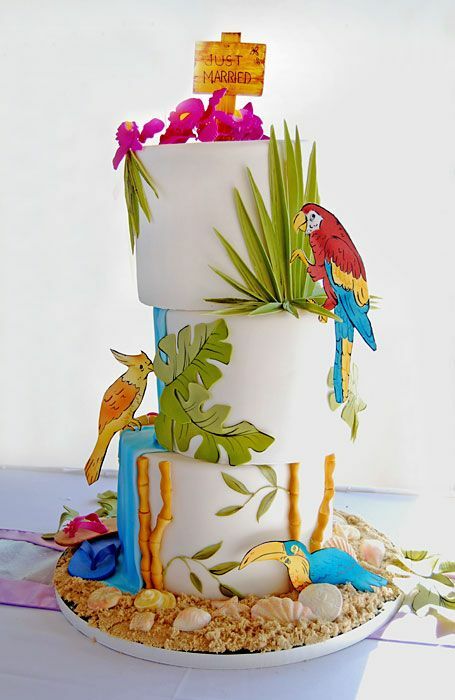 If you are planning an elaborate modern wedding, then make sure the wedding cake designs are tasteful and appealing. The days of dense fruit cake with a thick icing are gone, now the wedding cake market has evolved a lot with a lot of imagination and creativity involved in making the dessert tables and the wedding cakes. The following are some very beautiful looking and trendy wedding cake ideas of 2017.There is enough inspiration from these wedding cake trends that have been around for a while and some are absolutely new to the scene. 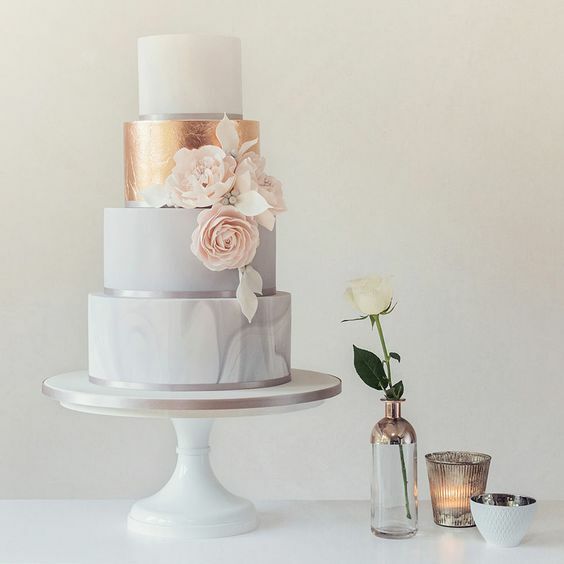 These wedding cake designs range from the subtle metallics to even bold colors that have taken the wedding cake market by storm. Flowers and weddings go together hand in hand. The flowers play a very important role in weddings. Give your wedding cake a garden fresh look by decorating it with lush blooms in different colors that match the palette. These pretty and exotic flowers are not only used for flower arrangements on the tables, bouquets and the wedding arena anymore. These exotic and pretty looking flowers can be used in the wedding cake designs too. The cute and yummy looking wedding cake idea takes inspiration from these humble flowers to convert it into a luxurious wedding cake trend. The wedding cake now looks glamorous and absolutely gorgeous. The flowers on a wedding cake can be selected to match the color, flavor and theme of the cake to make it all the more appealing. The choice of color of the cake and the flowers here are so perfectly matching that the flowers look like being made from cream. 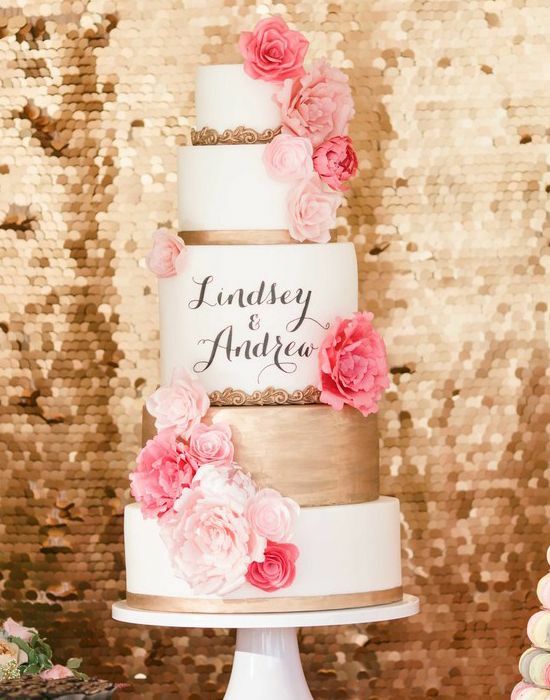 The metallic wedding cake trends are stealing the limelight from the traditional and subtle wedding cake designs. These cake designs have started taking centre stage at most weddings in the year 2016 itself and the trend has been gaining popularity even in 2017-2020. For a fashion conscious bride the metallic makeover wedding cake is most ideal for the occasion. The cake looks like it is dressed to impress. The use of metallic colors like copper, gold and silver tones have made their entry into a lot of modern wedding palettes and this trend is not going to fade away soon. Brides prefer bronze, copper, rose gold tone more and more. The advantage of this type of wedding cake design is that it can suit any setting right from rustic, shabby chic barn setting to a lavish and grand classic setup. 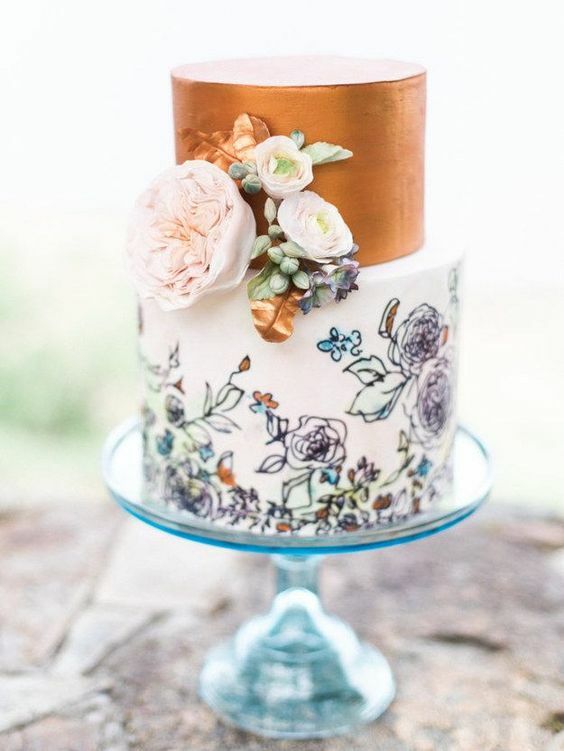 We have seen many fondant cakes with full metallic sheen, but of late we are seeing more and more textured metallic details like the Boho design. 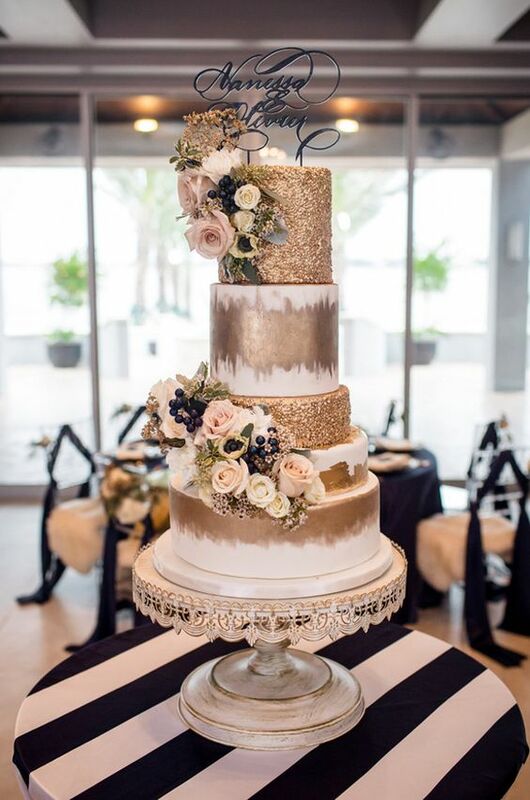 A tiered wedding cake with metallic detailing is glamorous and modern. Semi-naked cakes are one of the trending wedding cake designs on various social media platforms. 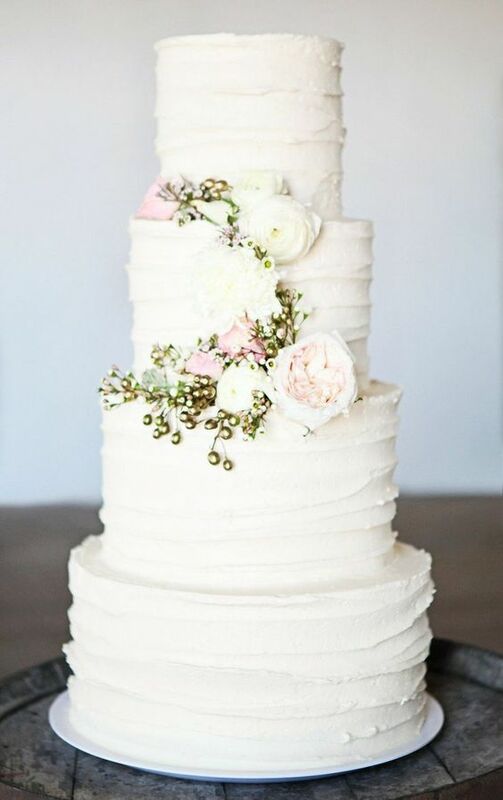 The semi-naked cakes have evolved from the naked cakes and are pretty similar in the concept. The only difference being it is covered in a very thin layer of cream that makes the layers of sponge visible with a sharp finish. The advantage of this wedding cake design is that it can be accommodated at various white wedding themes making it a very safe choice of color when it comes to the wedding cake ideas. This is a classic and crisp design that is not too old school, but also maintains the traditional color scheme. However, if you want to add some color to your cake you can decorate your naked cream cake with fresh and colorful flowers or even opt for delicate sugar flowers. If you are one of those who hate the regular cakes and want to go with something different for your wedding, then it would be nice to consider a strawberry tower cake for the occasion. 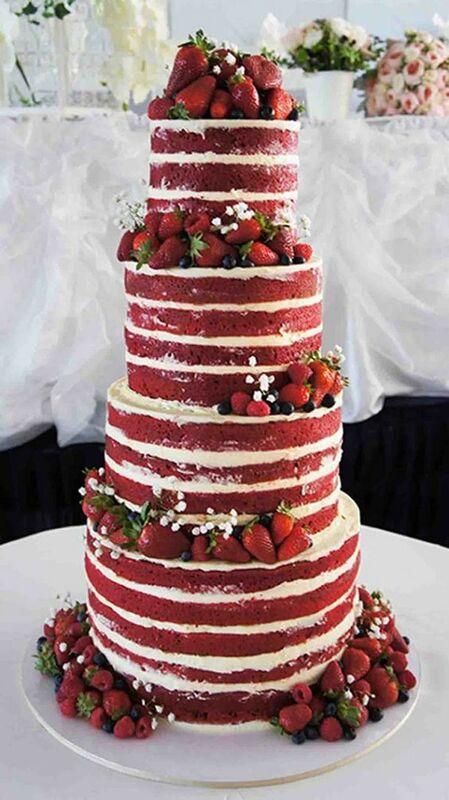 As the name suggests, this wedding cake is made from fresh strawberries. These strawberries are dipped in pastel or white colored chocolate. The choice of color can be according to the theme of the wedding. The wedding cake here is assembled with fresh rose and flowers. The chocolate dipped strawberries are decorated with metal leaf or pearls and sparkles. The strawberry tower will be stunning piece of art at the wedding venue that not only looks absolutely stunning due to the use of nice pastel shades, but is also very delicious. 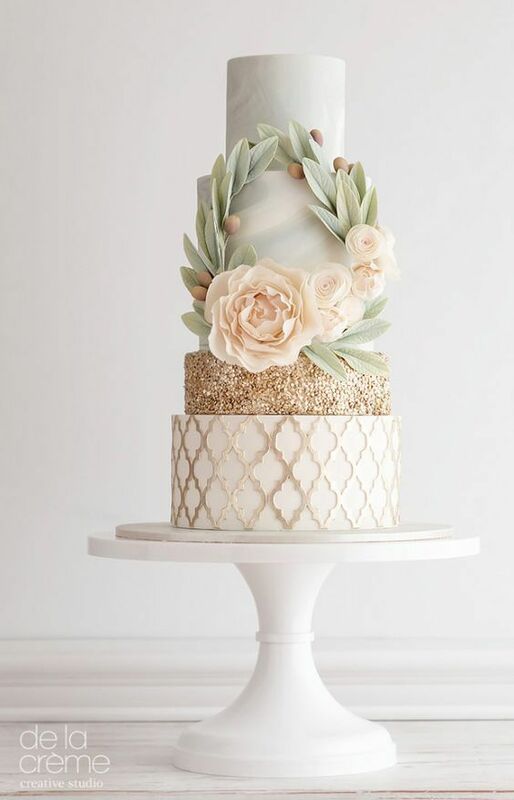 Marbles have adorned our homes for many years, but who knew that one day marble will be edible and take over the wedding cake trends by storm. The marble wedding cakes provide a stone like effect from outside. The elegant and swirled pattern look of a marble cake gives the wedding cake a sleek stone line effect and the final result is absolutely stunning. The marble finish is achieved by kneading together different shades of fondant for that amazing and smooth finish. 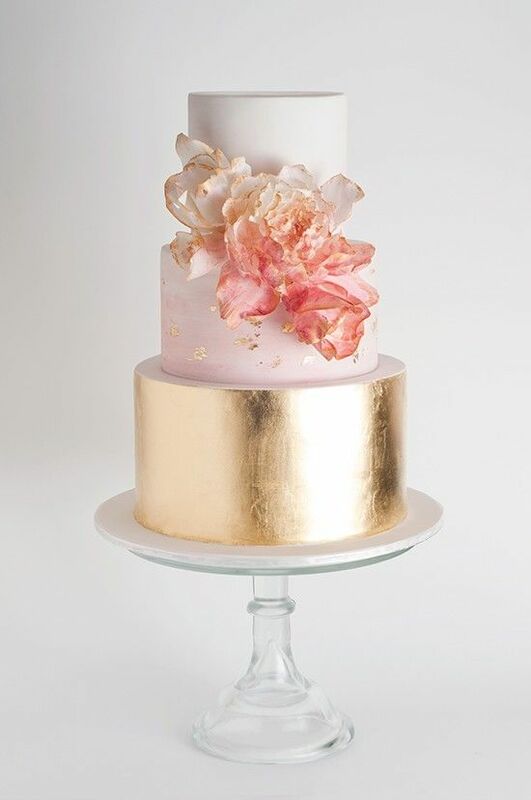 In contrast, to the naked cakes, the marble wedding cake ideas are luxurious and glamorous. 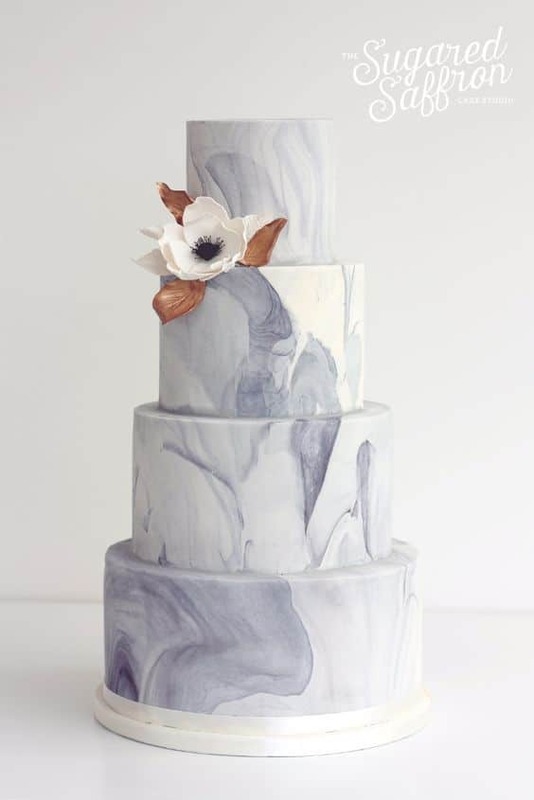 Marbled wedding cakes can be baked to add a wide range of tasty flavors that includes, white chocolate, raspberry, and caramel to name a few. The marble palette tends to be pretty neutral with the use of gold, grey and cream to emphasis the effect. The flower on the marble cake makes it look all the more appealing. Of late the cheese wedding cakes are quite a craze. Once these were a novelty at weddings, but now they are regularly been making their appearances at weddings everywhere. If you are a savory person, then wedding cakes made out of whole cheese rounds is a great option. 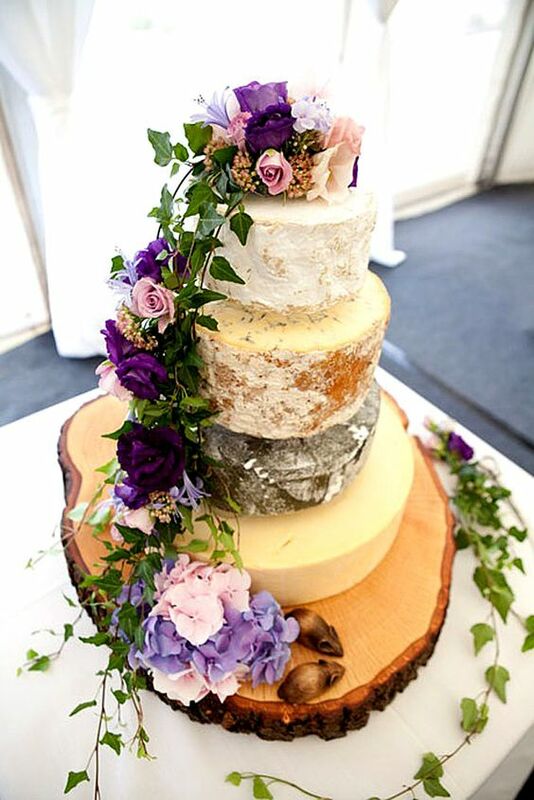 The tower of cheese is making its presence felt in a lot of weddings due to its visual appeal. The other reasons for their popularity being most guests prefer something savory after their celebratory drinks. The novelty factor has also played a good role in its popularity with couples trying to outdo others with their most original wedding. The cheese cake works out to be much cheaper per head and there are no big takers for a sponge wedding cake. This wedding cake allows you to add different varieties of cheese resulting in dessert option that appeal to the palette of most guests. 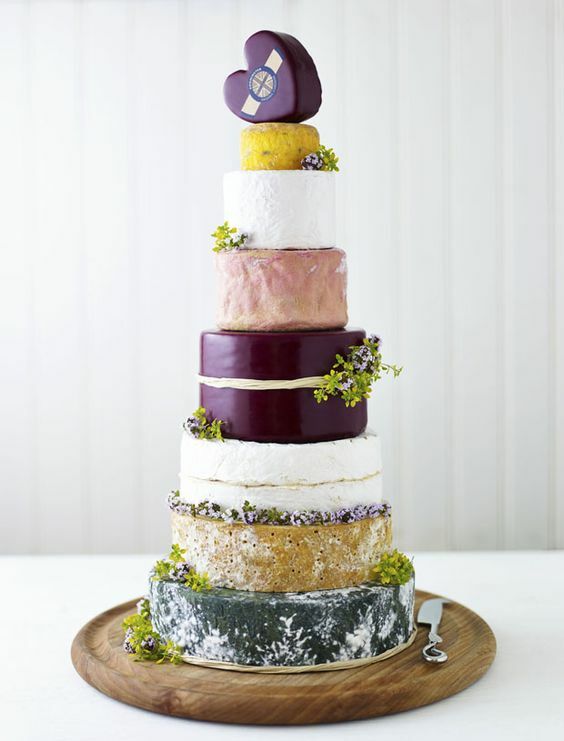 Add a few grapes, figs, berries and oat biscuits and you have a perfect wedding cheese cake. 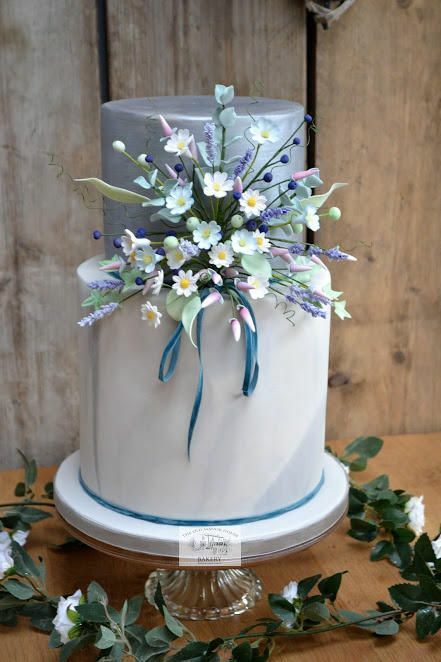 Having a gorgeous and tasty wedding cake is extremely essential for your wedding and the drip cake has taken the wedding cake trend by storm lately. The technique and the various styles used to create this cake are delectable designs and most modern cake makers have embraced this to the fullest. 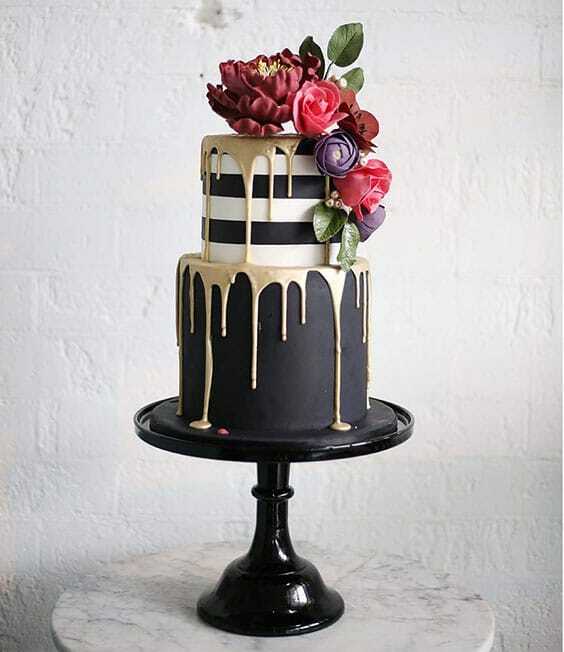 The color drip cake design is a one of kind avant-garde designs that makes a bold statement. The perfectly placed and shiny colored drips are calling out to “eat me”. You will struggle to keep the guests away from this gorgeous looking cake. 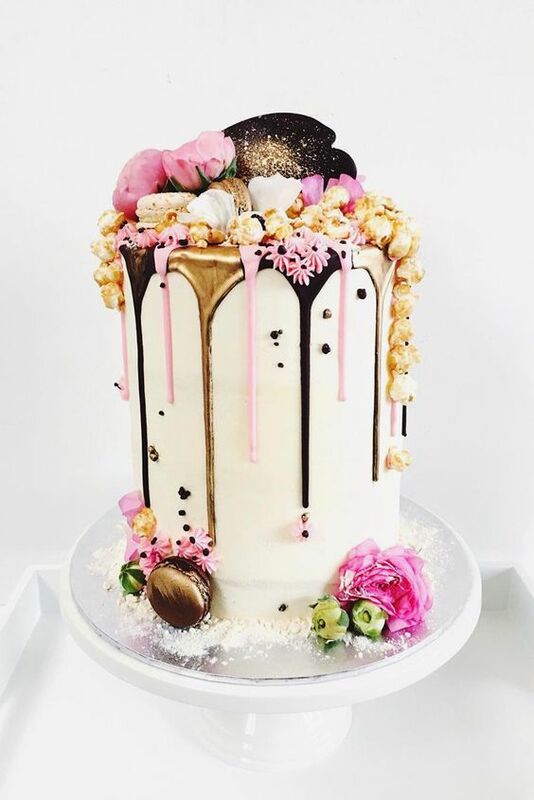 The drip cakes have taken the internet by storm and these cakes are made by drizzling a glaze or ganache over the top of the cake so that it appears to dribble at the edges. The final result is a wedding cake with a gooey tower of drippy ganache that will want you to grab your spoons and scoop up the spills. These cakes are generally topped with a mountain of delicious toppings that include fruits, macaroons, edible flowers, and chocolates. Who said that ruffles are only restricted to a dress? 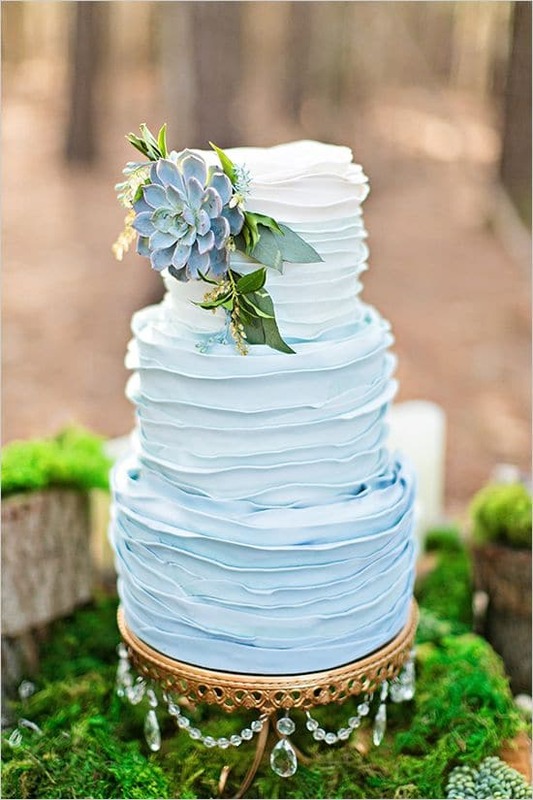 For a flamboyant looking wedding cake, the ruffled look makes it more attractive. 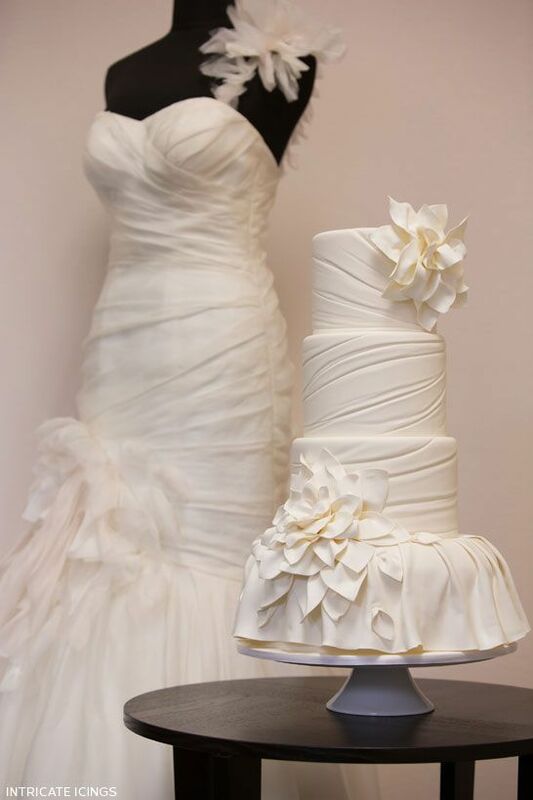 A ruffled wedding cake can be sophisticated as well as artistic. The ruffled wedding cakes range from vertical frills that are made of buttercream frosting or go for a full ruffled look with fondant of your chosen color palette. 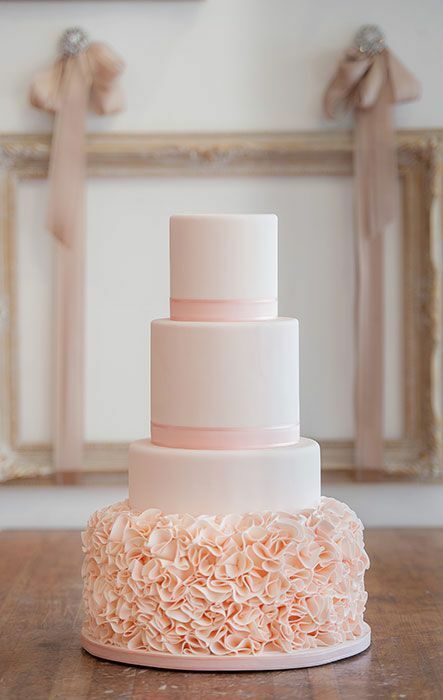 The ruffled cake can be polished, perfect, unstructured and even abstract. 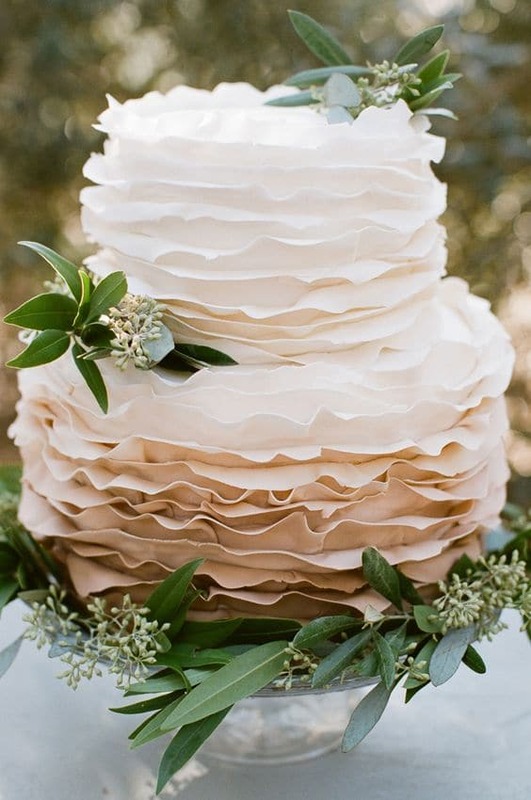 The ruffles of a cake look romantic and tasty. The variety and range of ruffle cakes vary. You can use one color for the ruffles and one for the edge, can experiment with Ombre and have ruffles that are monochromatic. Flowers are one of the favorite elements of a ruffle cake. You can create an entirely new texture by having the ruffles in different directions. The possibilities with the ruffles are endless. White wedding cakes are timeless and is always in fashion, but of late lot of couples are going away from the traditional white cake for an altogether new color for their wedding cakes. 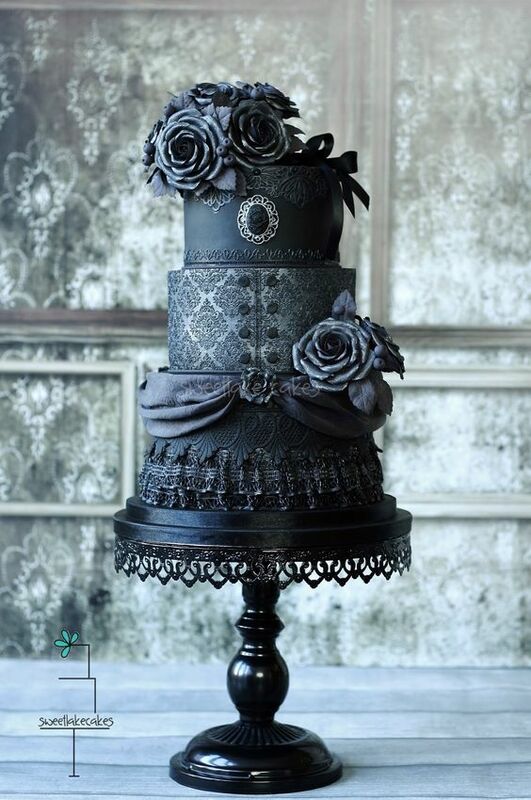 The black color is always considered unconventional for a cake, but black is not restricted only for Halloweens and Goths. Black wedding cake ideas look equally good if you compare them with their lighter counterparts. Black colors look moody, but are also opulent and sophisticated. If you are worried that the romance factor will be lost in a black wedding cake, then you need not fear. 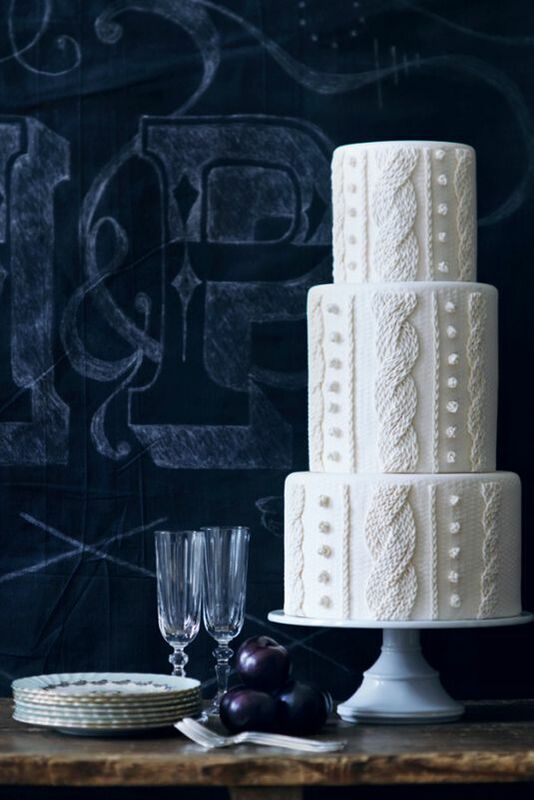 Black cakes from floral tiers to ruffles, classic, metallic and creative calligraphy covered blackboards are some of the many decorative options for a black wedding cake. The decoration options are equally good for a black cake just as you would with a white cake. 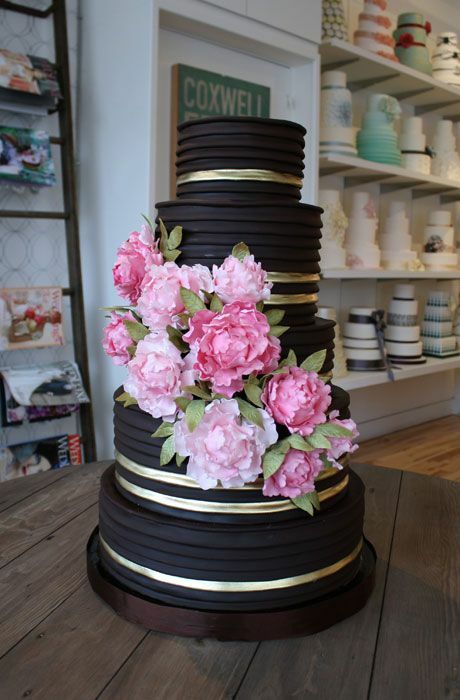 Black wedding cakes can be colorful, laced and floral to add that romance into the cake. The world of weddings and wedding cakes is full of fascination and inspiration. There are ample wedding cake designs that can be created with various individual elements and one such element is the hand painted wedding cake, a trend that is very popular. Hand painting is a simple method to jazz up and personalize even a simple looking wedding cake. Decoration includes pretty floral, modern graphics, and scripted prints. The choices of decoration are endless. Illustrated writings are a way to customize your cake. 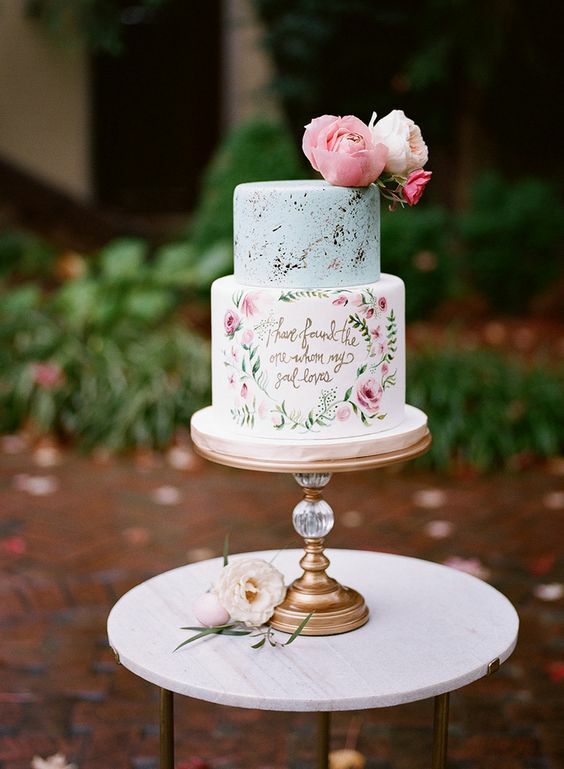 A quote or sweet words that represents you or as a couple, all of which are examples of a cute and perfect hand painted wedding cake. 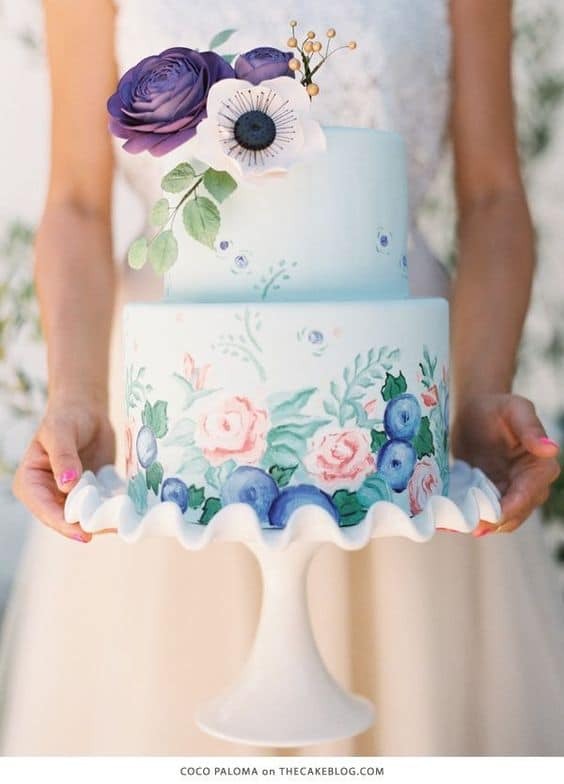 Geometric designs, fern foliage, pretty patterns, rainbow patterns, secret garden and garden green are some of the hand painted designs that can be created on a wedding cake. The options are unlimited as long as your imagination can explore. 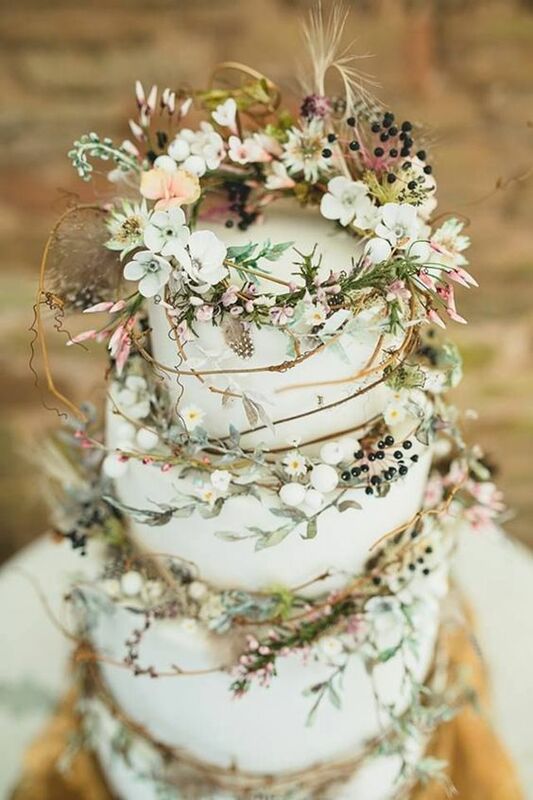 Woodland theme or forest inspired wedding cake trends have recently become popular and they are truly amazing for those who love the nature and want to throw a good outdoor wedding party. 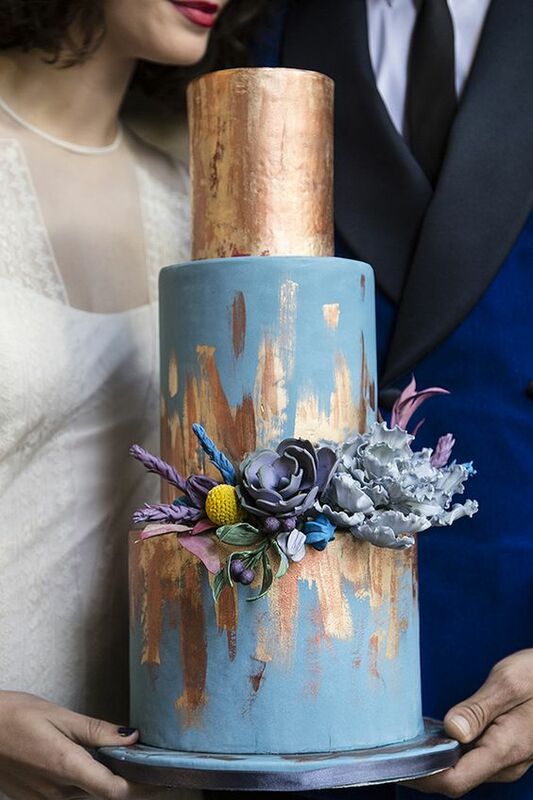 Forest inspired wedding cakes are unique and often become the talk of the party as they are a real masterpiece on the desert table. These wedding cakes take inspiration from the nature and the decoration also includes these natural elements like mushrooms, butterflies, brides, moss, greenery, twigs, flowers, berries and pine combs. These beautifully adorned woodland cakes are a perfect complement to the natural wild beauty. 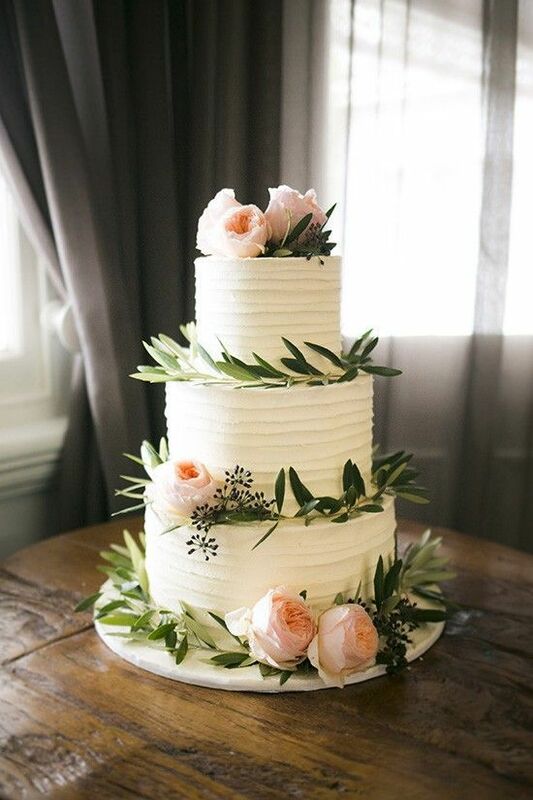 Instead of going for the traditional tiers and the classic fondant cakes, couples are opting for the subtly stylish wedding cakes that are earthy and closer to the nature. 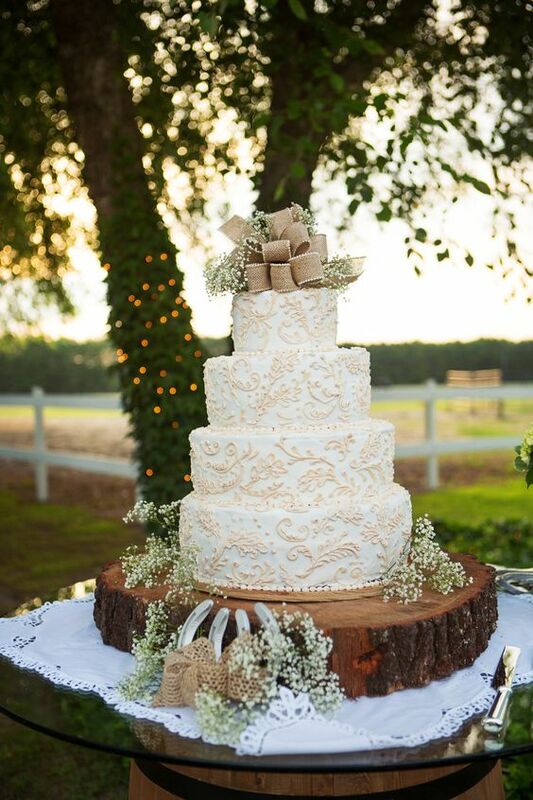 These rustic types of cakes are perfect for fall weddings as they serve a perfect canvas for the autumnal accents like the acorns, seasonal flowers and the fall fruits. 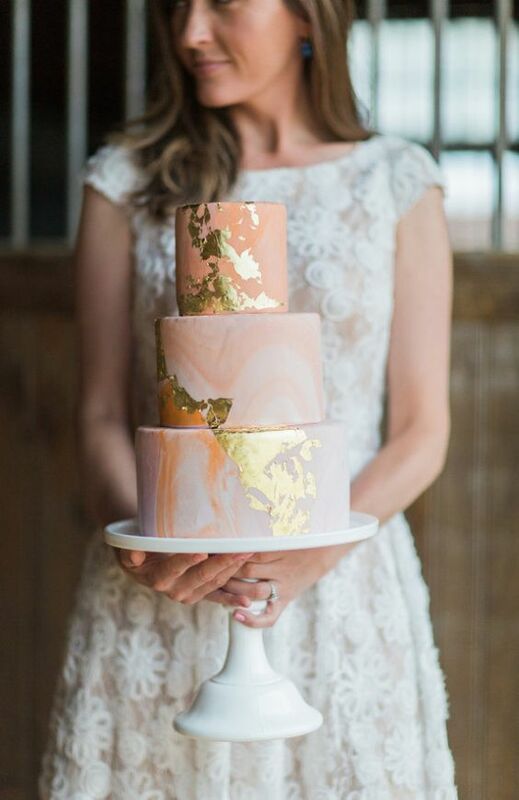 Ombre wedding cake ideas are here to stay. The Ombre trend has taken the fashion industry by storm, but no one would imagine this trend would take over the wedding cakes too. The choice of options is many, whether you go for the buttercream ruffles, or the Ombre inspired layered cake interiors. The best part of the Ombre inspiration is the ability of the design to incorporate as many shades as possible of one single color in progression. One single color, transitions from dark shades to light almost seamlessly. The Ombre color works for every color shade and hue depending on your liking. You can start with an electric fuschia and work towards achieving a soft blush hue. If you hate bright colors, then start with Ombre white and transition into pale blue and deep indigo. Just like any other wedding cake designs, the Ombre wedding ideas are unlimited, so get ready to work out your creative juices for a beautiful Ombre inspired wedding cake. Cable Knit designs have gained popularity in the wedding cakes too. These types of cakes are perfect for brides who are obsessed with the sweater weather. 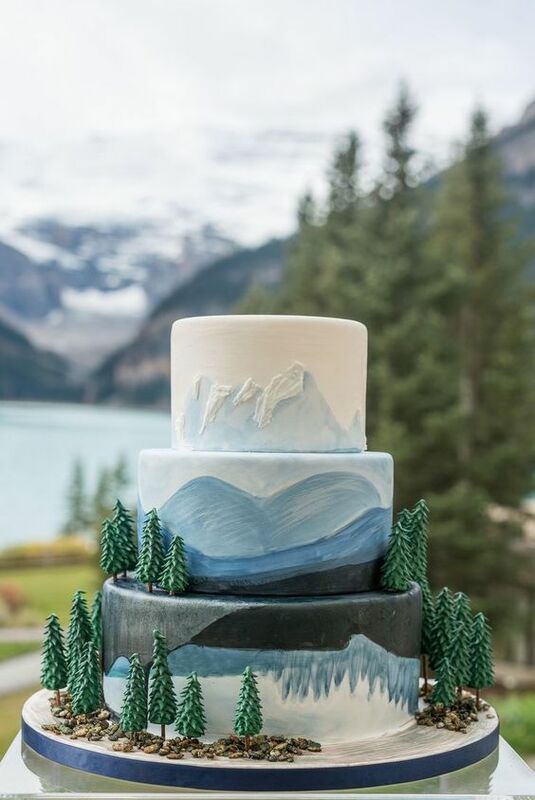 Yes, winter may not be the popular weather to read the wedding vows, but the cold months can be a good inspiration for some amazing wedding cakes. A lot of bakers are creating some very incredibly beautiful knitted wedding cake designs that look like they have been knitted as a your favorite sweater. These trendy cake designs are made from fondant and the details are edible and cozy. 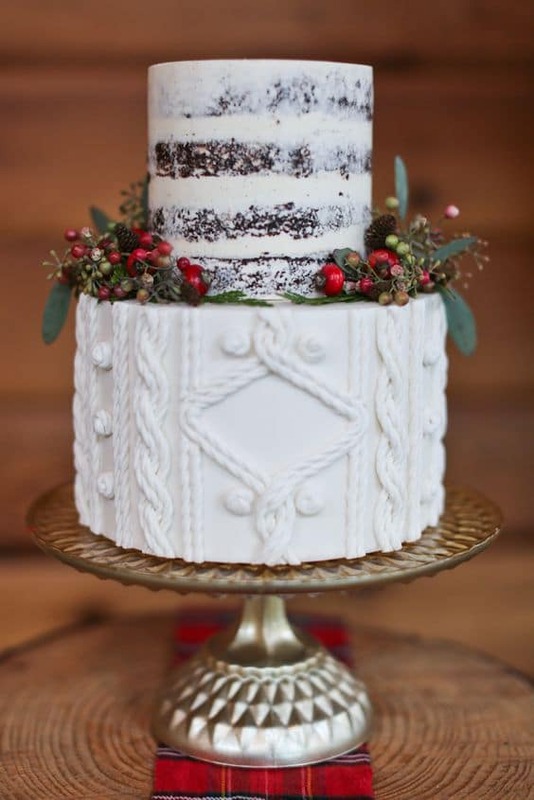 The knitted cake adds a good seasonal touch to your winter weddings. The cable knit designs are a good way to add some texture to the wedding cake. The cable knit wedding cake trends are ideal for your weddings that will remind you of the cozy winter wedding even after the reception. The white wedding cake has always been a popular trend and their popularity has always peaked every year. All of us love the colorful cakes that adorn the table on weddings, but white wedding cakes have that stunning and simple aura attached to it. An all white wedding cake is a tribute to the traditional wedding cakes that have found place in almost all the weddings of our parents and grandparents. The wedding cakes now can be customized to your liking, even if it is a simple white wedding cake. It can be created to reflect your contemporary tastes by introducing some cool patterns or designs. The design options are not limited if you go for an all white wedding cake. 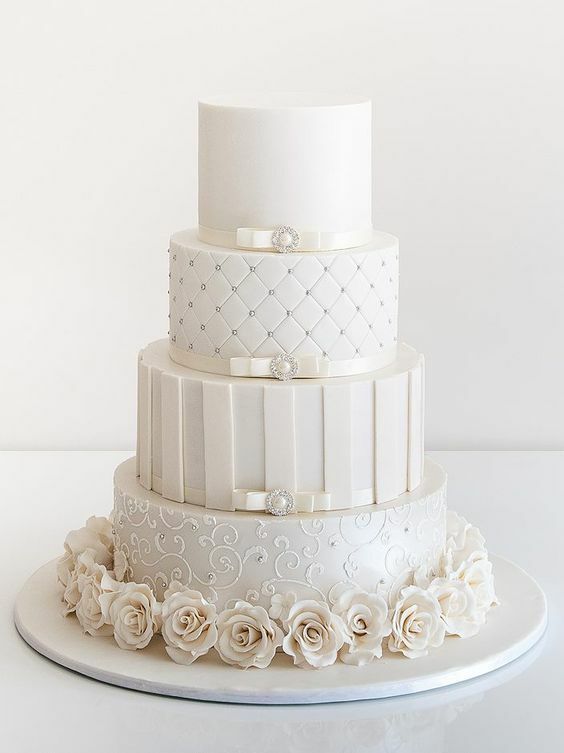 If you love sugary flowers, lace piping or even the fondant details, then choosing the white wedding cake as a dessert that will provide a lot of refinement and taste. 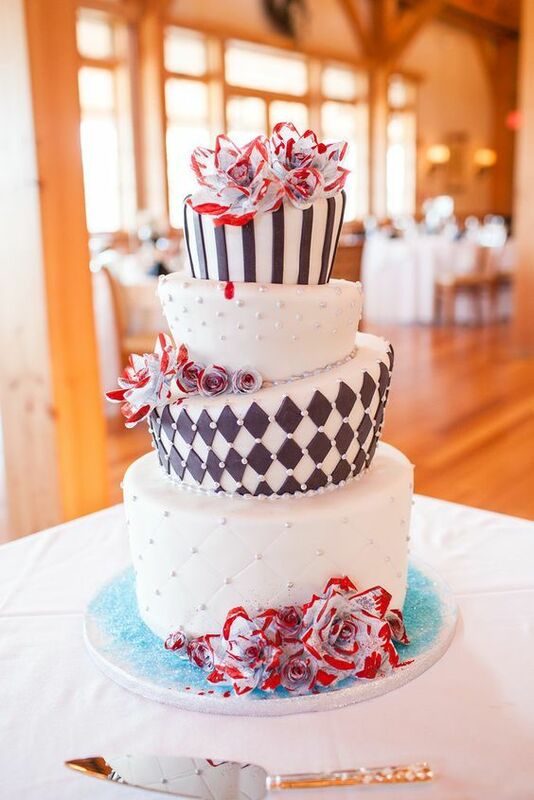 Swiss dot detailing, rough frosting and ruffles are a good option to decorate a white wedding cake. White frosty looking wedding cakes are great for all types of wedding, be it a formal one or a beach wedding with a lot of fun and frolic. Lace and romance goes hand in hand. Even the wedding gowns are decorated with lace for the wedding day. No wonder the lace that has been associated with feminine and has been an inspiration for everything from invitations, to gowns and even wedding cakes. The lace wedding cake designs are created from intricately designed royal icing designs, hand painted lace to real lace stencils are all some of the detailed ways to translate a lace onto your wedding cake. Because of a lot of detailing that goes into creating a lace wedding cake, you can be assured that no two lace wedding cakes will be similar. 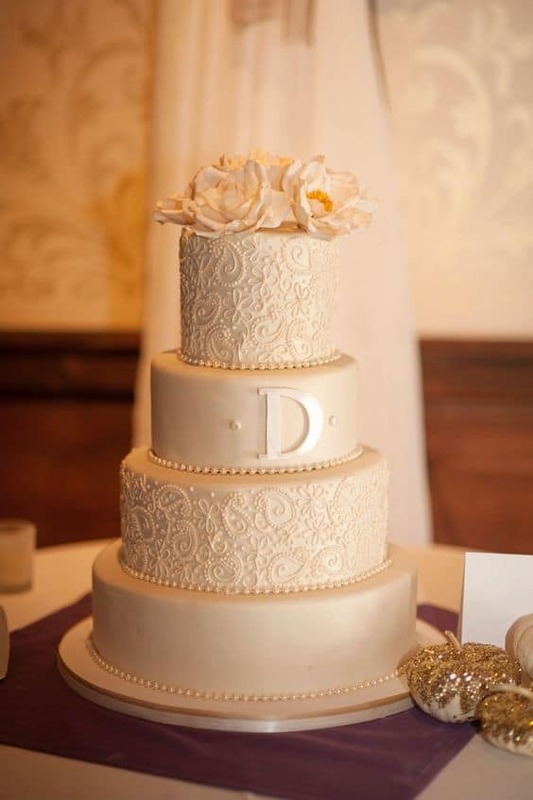 Lace wedding cakes look regal and elegant that gives your reception a vintage appeal that goes well with your dress. These are true masterpieces and piece of art created painstakingly by a master artist. The wedding décor should match the elegant looking lace wedding cakes. Get inspiration and fill up your wedding table with this piece of art. There are so many different wedding cake alternatives that choosing one for the occasion is often very difficult. 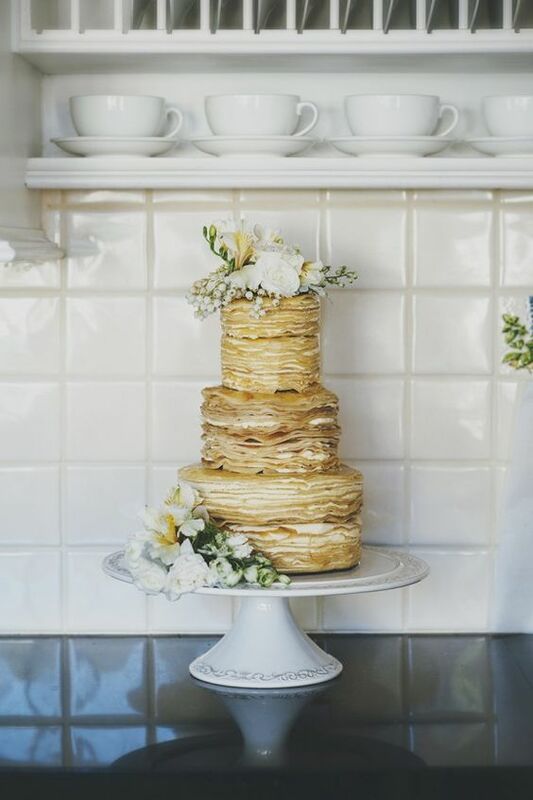 Pancake wedding cake ideas are one such wedding cake trend that is catching up. 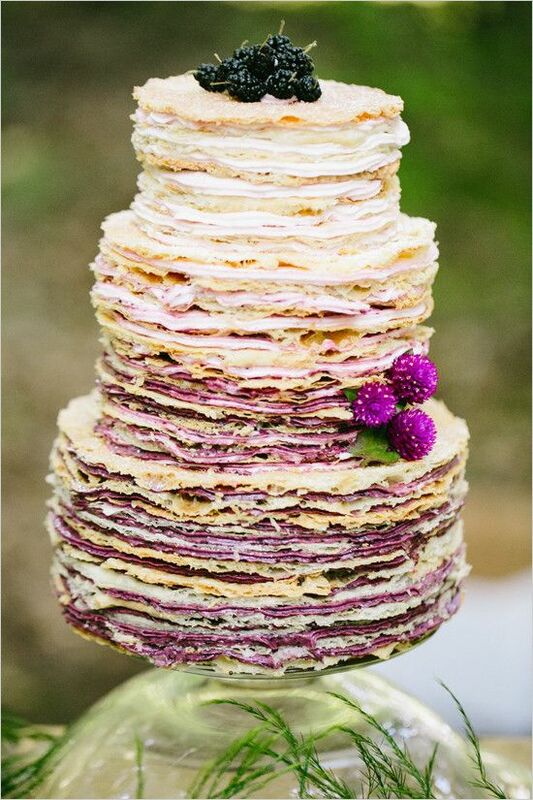 The pancake wedding cakes are pretty interesting and one that is an idea that is a result of some out of the box thinking. These cakes give you a homely feel and are extremely lovely and sweet. You can sprinkle sugar on top and layer them with your favorite filling and your pancake wedding cake is ready to transport your guests to their childhood and bring in a lot of smiles on their faces. 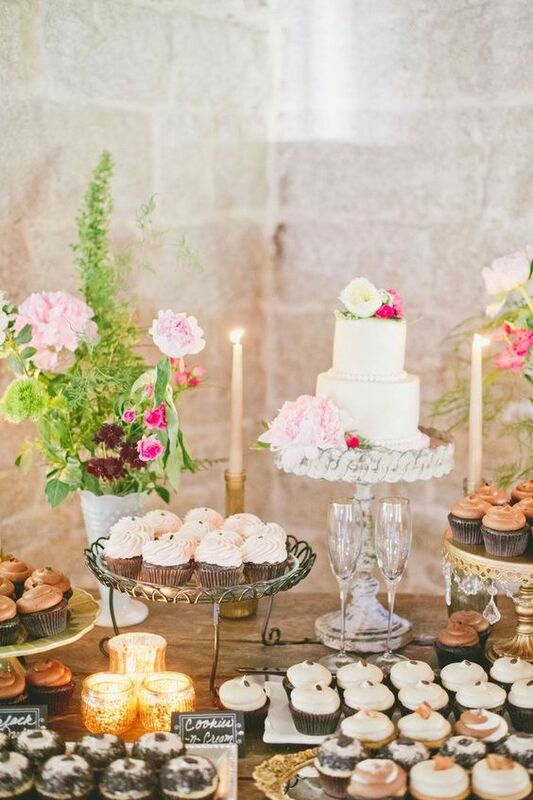 These cakes are ideal for any kind of weddings, just that you need a petite cake stand. For a rustic theme, adorn the cake with some local flowers, fruits and berries to complete the cake. These bite-sized treats are a great alternative to the three tiered wedding cakes. Beaded cakes are elegant and gorgeous looking cake designs of the year. Elaborate sugar beading can add some glitter and bling to your wedding cake, which will make your wedding cake a centre of attention at the reception. Each and every bead is made from carefully designed sugar, which when added to your cake will increase the luxury quotient of the cake. This is a perfect cake if you are planning to get married at a grand and elaborate venue like a ballroom or a vintage estate. To complement the opulent settings of the wedding, the beaded cakes can incorporate some sparkle to the desert table. Beaded cakes combine sweet fondant ruffles, quatrefoil and elaborate beading to arrive at a cake that is absolutely elegant and beautiful. Beaded cakes are for those who want to make a real statement. It will certainly generate a wow factor at the wedding venue. 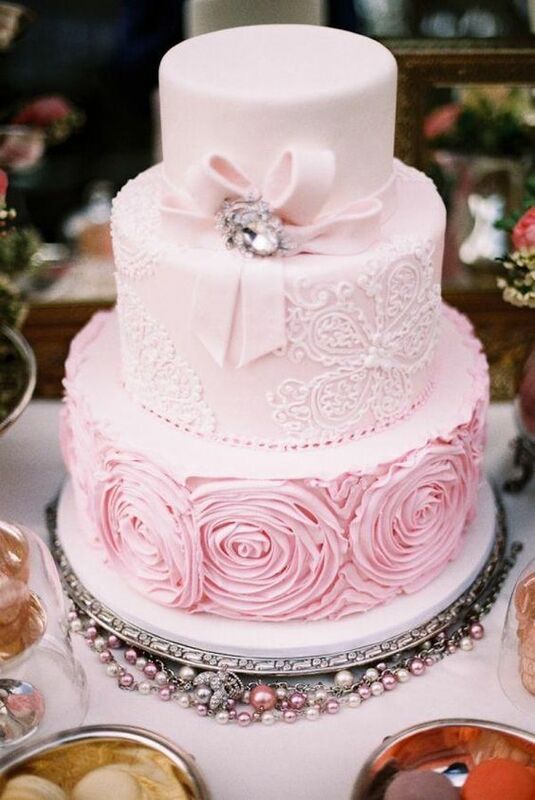 Pink is one of the favorite wedding color schemes for dress, settings and even cake. 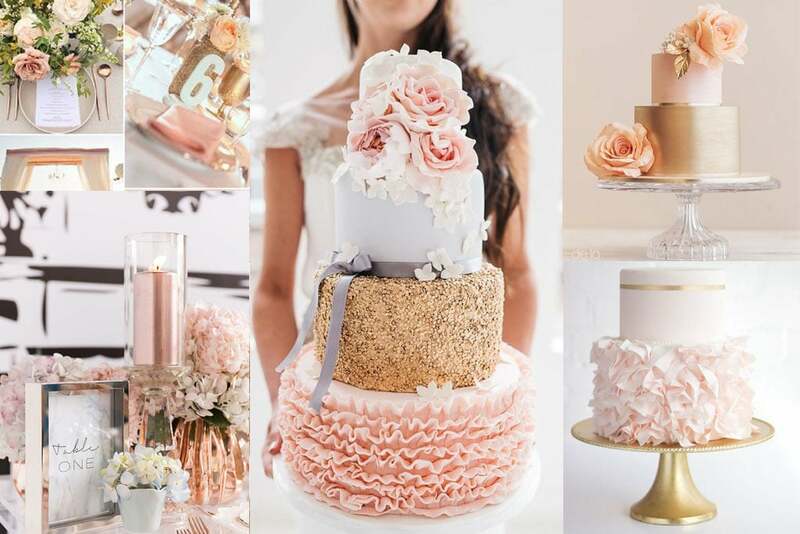 You will be spoilt for choice when it comes to choosing the correct pink wedding cake that will match the theme of the wedding. The color pink represents purity, softness, loyalty, compassion, protection, loyalty and happiness. 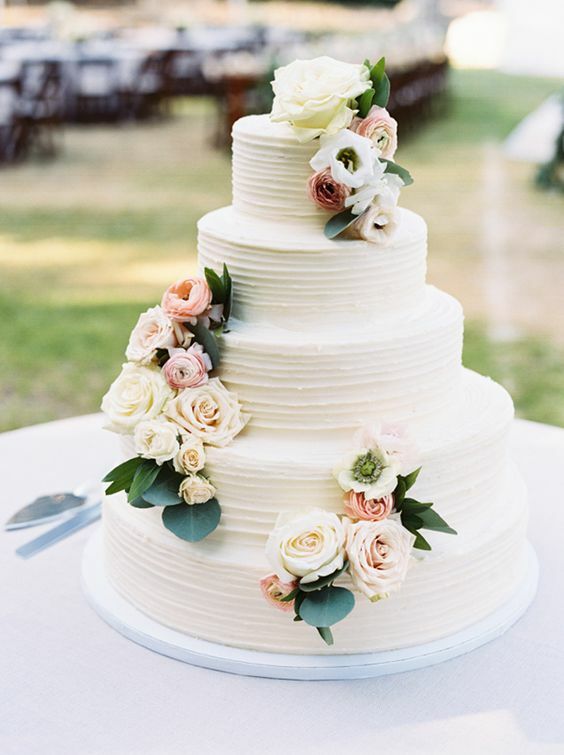 A tiered pink and white wedding cake adorned with cascading garden roses, some hydrangea and berries are all that is required to create a pretty and elegant looking wedding cake. 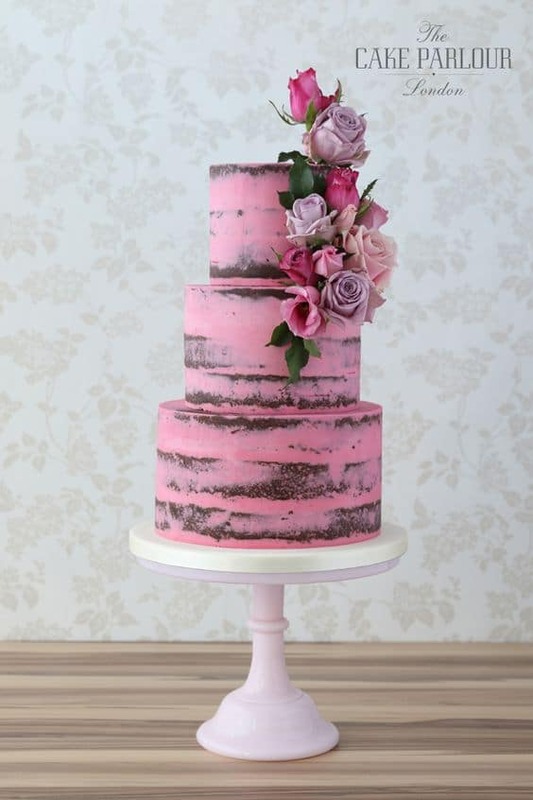 Pink wedding cakes are perfect for girly brides who like a romantic wedding cake. The use of sugary flowers and beads on the cake add a lot of beauty to the wedding cake. Pink wedding cakes are perfect for almost all types of weddings, with just a few changes here and there; these cakes can fit into any wedding theme with a lot of ease. Creative wedding cake designers are apt at creating the perfect replica of your choicest cake that is very feminine. The wedding dress is an important part of a wedding, but did you know that your wedding dress can be used to create an intricate piece of art in the form of a wedding cake. The wedding dress cake will surely make most brides happy. 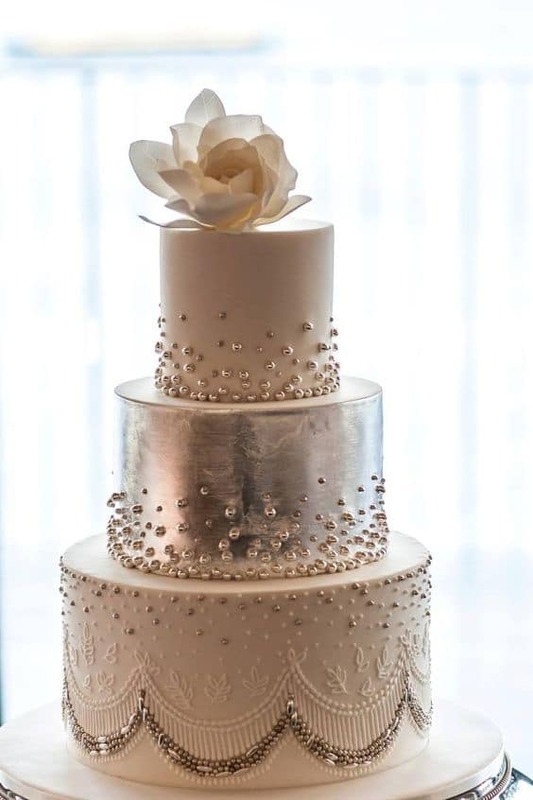 This elegant wedding dress cake is covered with pearlized jimmies and sugar pearls that add the dash of elegance to this white colored cake that is one of kind and unique. 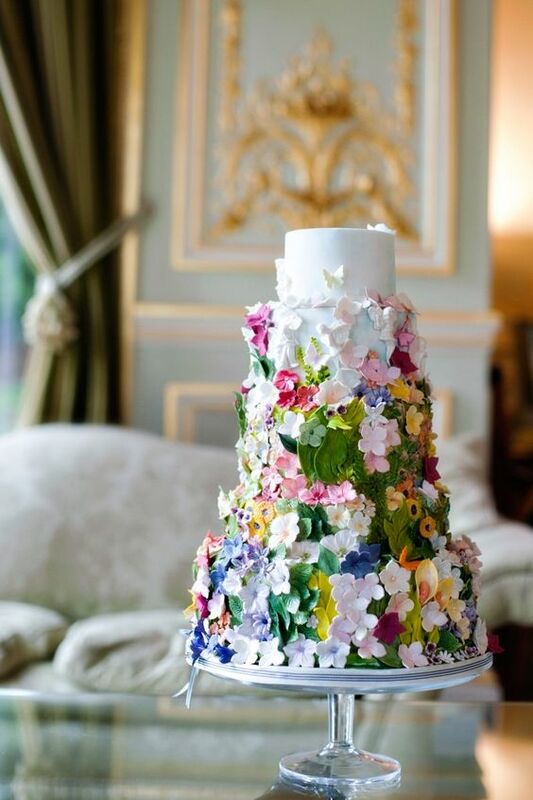 This is a stunning wedding cake that looks as if it is just out of a fashion show. This is a perfect treat for any kind of weddings, for bridal showers, or even a fun desert at a bridal party. You can even frost it and place small purple flowers on the dress and work around with different color ribbons on the cake. The wedding dress cake will always remain cherished in your memories for years to come. Color drip wedding cakes are actually cakes that are decorated with fondants, dirty iced, soft iced, or even left naked. This cake is then covered with a layer of dripping chocolate, caramel, sweets or ganache that is left tricking on the sides. The final creation will make your guests mouth watering for more. You can have these cakes made on single tier and even go up to more than two tiers. 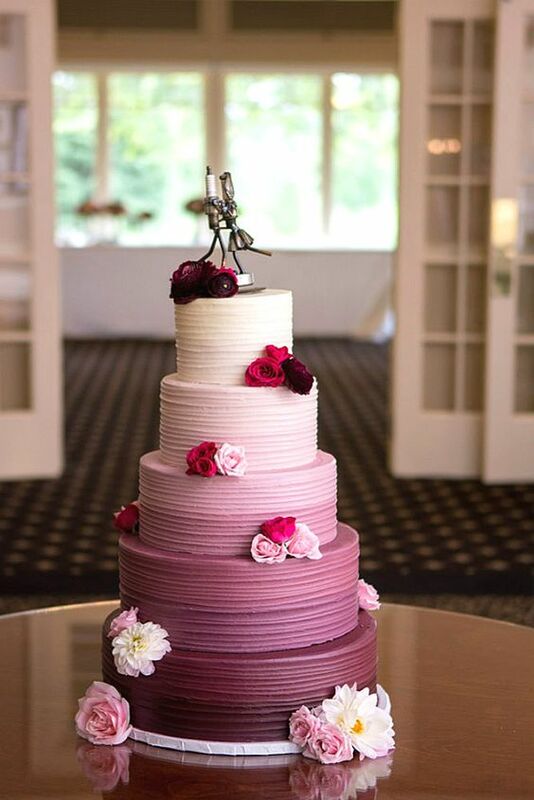 You can mix and match this type of wedding cake with different varieties of cakes at the bottom and decorate the top cake with color drip like the one below. These kinds of cakes are nice for any kind of weddings. Keeping the kids away from this cute and yummy looking cake that looks like M&Ms stuck on it will be quite a task. Green wedding cake ideas have started making their presence felt in wedding cakes and brides have happily accepted them for their weddings. 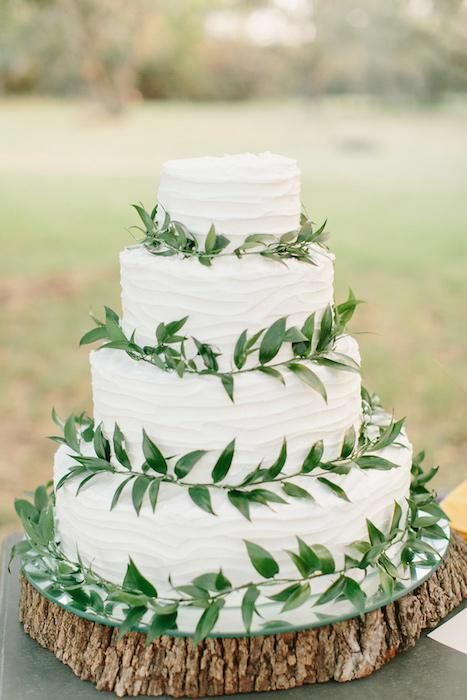 Weddings with minimalist or an earthy theme have seen foliage or greenery cakes as their main dessert. A lot of greenery with a dash of cute polka dot detailing on your cake makes the dessert absolutely stunning. The yellow colored polka dots on the white colored base is a ray of sunshine to the all green floral motif making the cake look pretty neutral. You can decorate these simple little cakes with a cascading ivy trails that run down from the top of the cake. You can get inspiration from the woodland life and create cakes that are decorated with handmade wood pennant and moss topper. It looks playful, sweet, subtle and stylish. But, if you are getting married during the summers, then you will be naturally worried that your greenery may wilt, but now there is no cause for concern, as paper flowers and garlands are a great looking alternative that looks lovely. Are you tired of the regular laced and floral wedding cakes? Then, you need to look for ideas that are quite different from the rest if you want to impress your friends and relatives. Topsy Turvy cakes are something that you need to look into as this type of cake is difficult to create because of its strange shapes. Their unique shapes makes people wonder how these cakes balance. The secret behind this is optical illusion that makes these cakes appear to be slant. The cake artist uses a mix of various shapes for an eye-catching appearance. The baker then fills in décor elements or flowers between the tiers to make it more exciting. You can even add fruits, polka dots or any other prints for the effect. 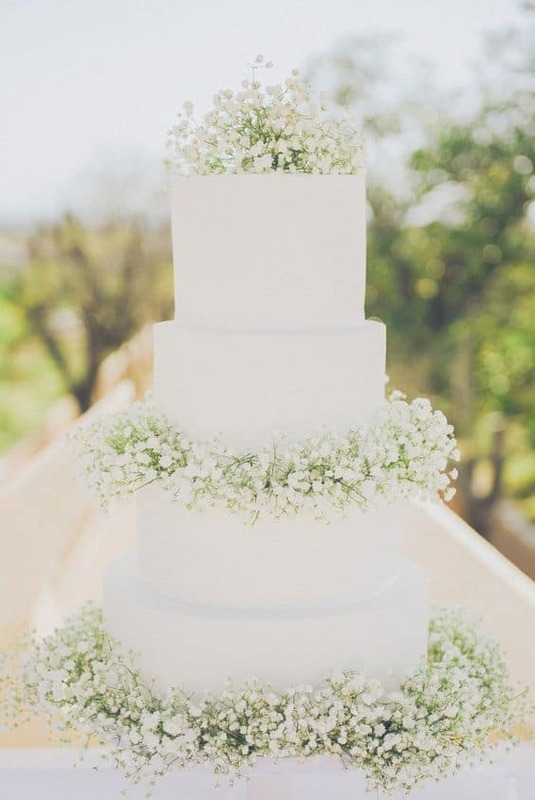 You can even create an elegant white wedding cake with simple and stylish looking flowers. The Topsy Turvy wedding cake is a nice idea for a creative and fun wedding party. Who doesn’t like a red velvet cake? Red velvet cake is not only romantic, but also very tasty. A slice of red velvet cake is always inviting. The traditional red velvet cake is moist with a velvety texture, chocolaty flavor and a classic cream cheese frosting. 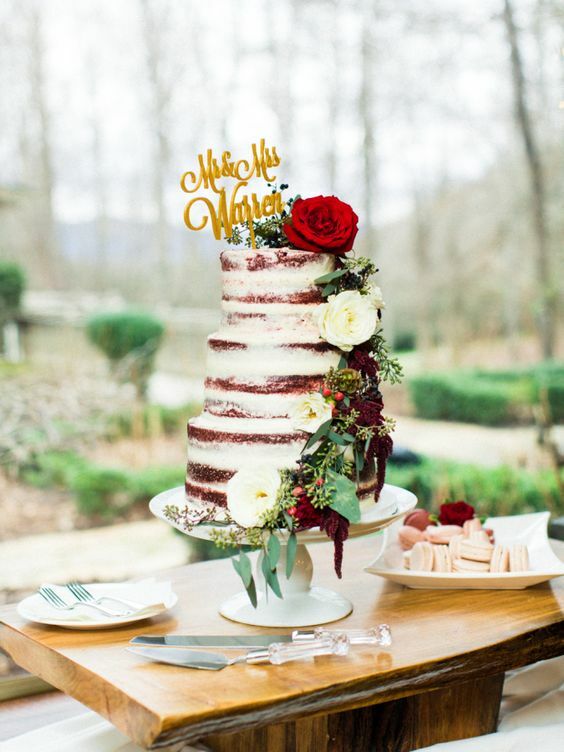 The red velvet is a perfect wedding cake idea or a celebration cake. A lot of bakers are experts at creating a nice red velvet cake. The cake can be decorated with peonies, marzipan and ermine frosting, vanilla with greenery, naked cake with icing and jam, raspberries and dirty ice. The possibilities are many if you run through your imagination to make that perfect looking red velvet cake for your wedding. You can use any flavor of frosting, but the classic cream runs the roost. The sliced red velvet cake looks very inviting and you can be sure that the guests will return home satisfied. Fruit wedding cakes are not very popular today, but to compensate the traditionalists, white and ivory wedding cakes are being introduced. The white and ivory wedding cake designs are versatile and timeless. They look royal and appealing as well. This cake was not so popular a few years ago because of the various trendy wedding cakes that have flooded the market, but now lot of couples are opting for these gorgeous looking cakes that suits all types of wedding theme. 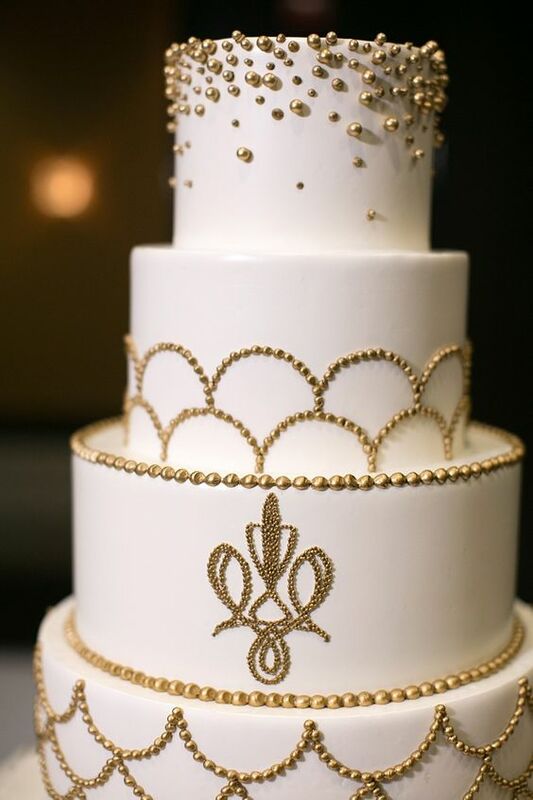 These cakes are even suitable for ornate and regal ballroom weddings. Decorate them with sugary flowers, beads and fondants to add a nice regal appeal. They are a big canvas where you can create your innovative designs and are far from being boring. 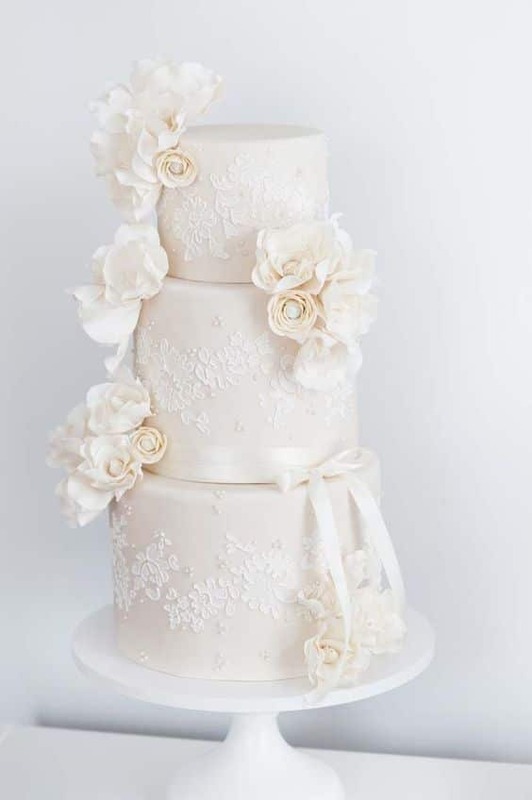 The white and ivory cake looks beautiful with cascading sugar or real flowers by just adding some icing or sugar paste and you can convert an elegant looking cake into a regal one that is sophisticated. Wedding cakes and flowers go together. They are dressed with fresh sugar flowers that are very inviting. The flower bouquet wedding cakes is a fresh new take on the wedding flower accents. The aim is to create a nice balance of shape, size and color. The flower bouquet is best suited for muted cake base color designs like ivory, peach and mint. These bouquets are good for single as well as tiered wedding cakes. These tiers can be finally decorated with silver or gold metallic trim or a beveled lace for a sophisticated, yet classic looking wedding cake. The combination of sugary flowers and light shade wedding cakes works like magic. The flowers on the cake make them look elegant and absolutely beautiful. The illustrated and graphic art wedding cake designs is one arena where the artistic skills of the cake decorator are tested. Actually the truth is that you can get anything printed on your wedding cake, but the final product depends on the skill of the decorator. 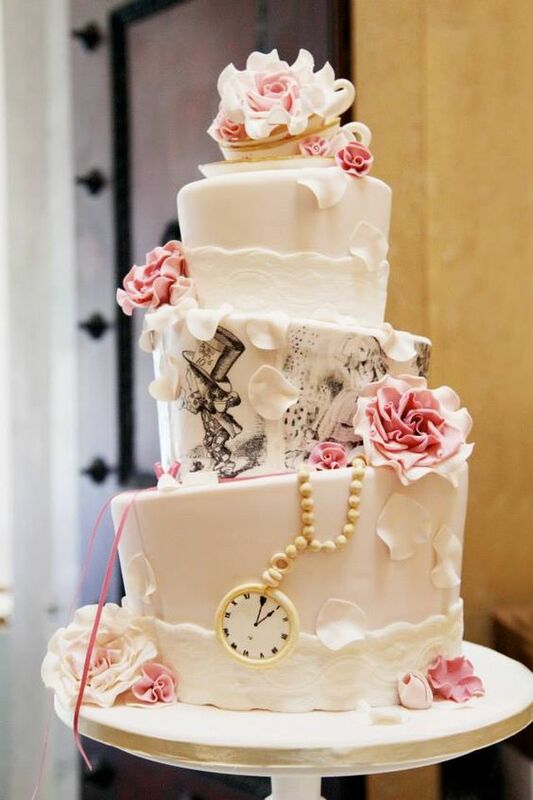 You can run through your imagination and pick anything from your wedding invitation, pop art, comic strip characters, your first song, dance, and wedding motif like an oak tree or anemone flowers to be created on your cake. First, the cake is covered with fondant and then it is hand painted on the cake. The final product is a piece of art or a classic piece of painting that takes the simple looking cake into a masterpiece, all of which depends on the skill of the master artist. The cake need not be restricted to one layer, but you can have tiered cakes with the graphic art flowing seamlessly from top to bottom. 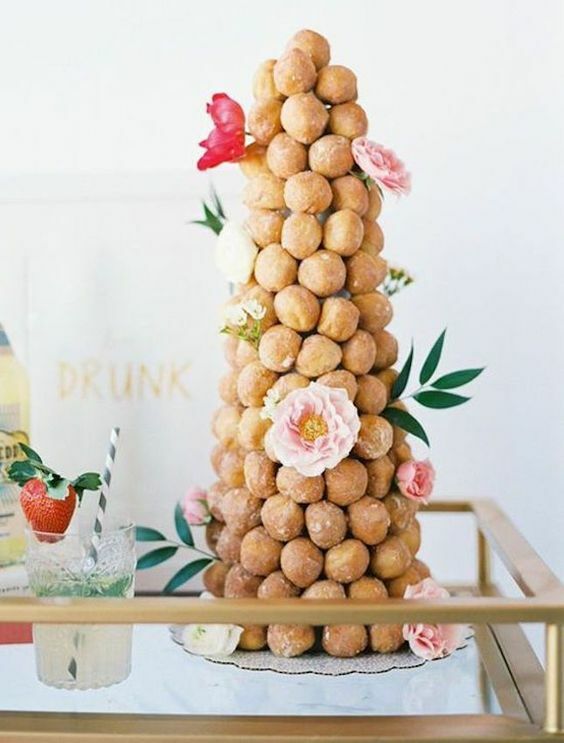 Croquembouche is a traditional French wedding cake and is a latest trend in wedding cakes today. 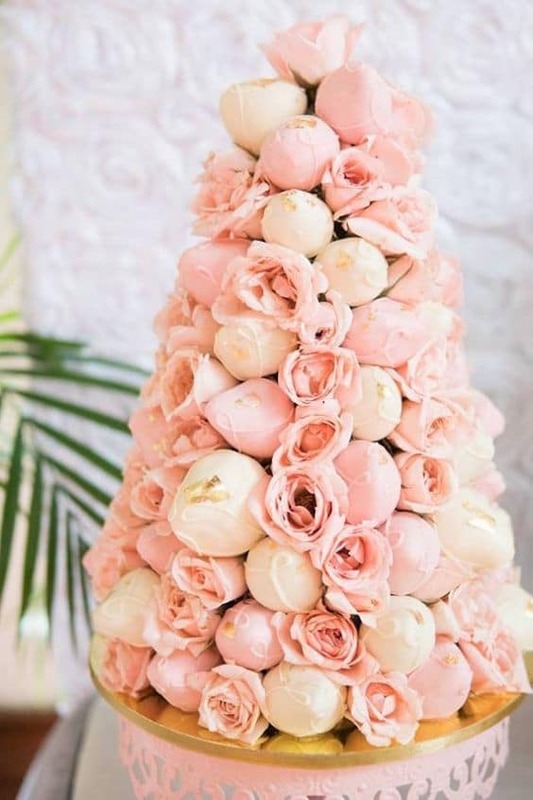 For French or Paris themed weddings, the Croquembouche wedding cake designs are a must. 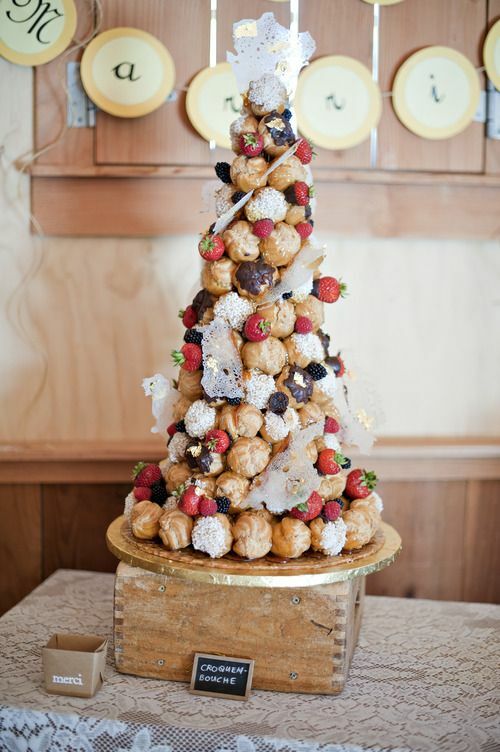 To add the French or Parisian glamour to the wedding cakes the Croquembouche is a must. Instead of going for the traditional and classic buttercream cakes, serve your guests the French masterpiece that will surely be loved for sure. The Croquembouche is a tower of cream filled puff pastry balls that are set up in a shape of a pyramid and encircled with caramelized sugar. This sugar gives this traditional French cake the name Croquembouche, which means “crunch in the mouth”. In addition to the caramelized sugar, the Croquembouche can be decorated with chocolate, icing, sugared almonds and candy ribbons. A good cake decorator will offer a wide selection of crème flavors like rose, caramel, pistachio, orange blossom and vanilla. The most popular being the vanilla-bourbon cream that is flavored with a touch of aged rum. Wedding cake designs depends a lot on the personal preference of the couple. The buttercream wedding cakes are in that sense pretty versatile. All the ingredients and decoration, flavor and color can be crafted to suit any couples style and taste buds. The buttercream cakes have always been a crowd puller at various occasions because of its deliciousness. Buttercream cakes can be easily flavored and colored; spreading becomes easy and also offers a wide canvas for decorating with flowers or piping that go well with these cakes. There are countless design options for this cake and are not too heavy or sweet. You can have them in towers or any other shape and decorate with sugared citrus fruits. These are always great to design especially for people who lack the liking towards fondant covered cakes. Buttercream cakes are ideal for those who like the different texture that are on offer from ruffles to sleek edges. Cake trios, quartets and quintet tables are quite a trend in the wedding cake designs. They are quite beneficial too. 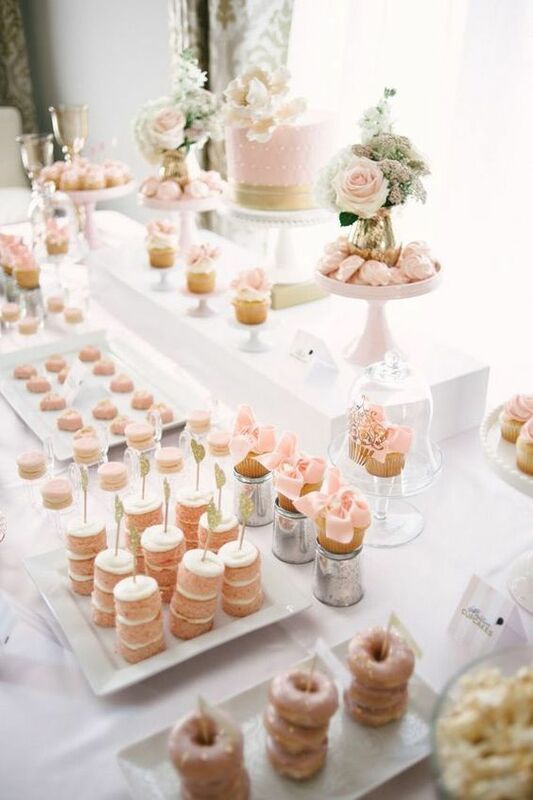 Firstly, the large table for cake gives an opportunity to create some visually appealing display at your reception. This means you can dedicate a separate place to display your wedding colors and theme. The next advantage of this setup is that you can decide to choose from a variety of cake flavors so you don’t have to decide between the traditional vanilla, chocolate, carrot and cream cheese frosting. Your guest will love the idea of tasting different flavors of dessert or have a bite of each flavor. Restrict your options to eight as one person won’t try out more than four flavors. Too many options or choices of wedding cakes can overwhelm your guests making it difficult for them to try them out. 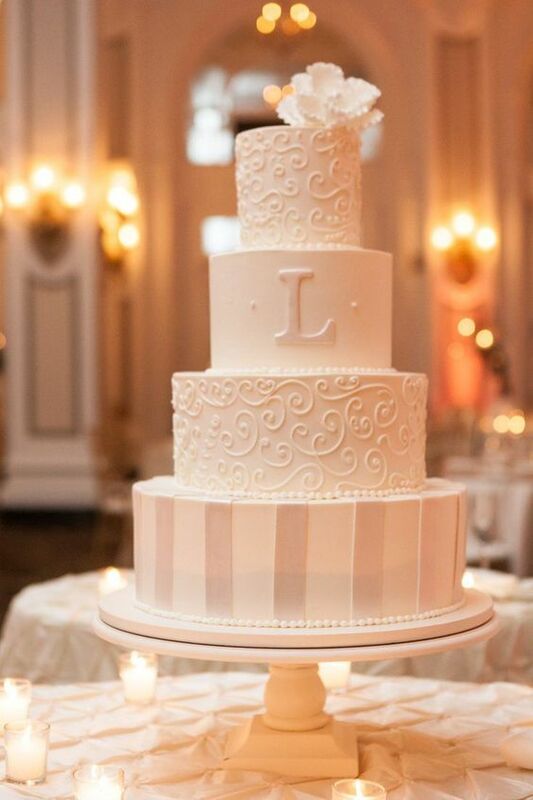 Monogrammed wedding cakes are a trend these days as more and more couples prefer this type of cake for their wedding. It is a nice way to celebrate your newly shared name and is a classic way to decorate these kinds of cakes. They are either printed, calligraphed or illustrated. The initials on the cake, gives a lot of importance to the family and the new bonding, giving the process a more personal touch. 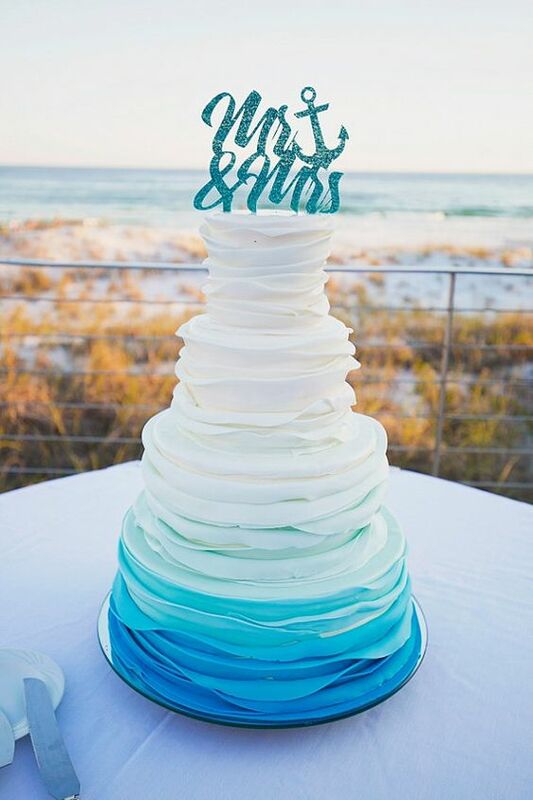 The monogrammed wedding cakes are a new way to celebrate your wedding vows as monograms on invitations, on towels and signage are pretty common. These cakes can be classic, traditional, modern, timeless, fun and unique. Get new ideas for incorporating the initials into the cake frosting or on the cake stand. These were 30 top wedding cake trends that are quite popular among couples. With so many themes and creative palettes on offer, it will be pretty easy to put your heart on one of these. So, which of these wedding cake designs are you looking forward to the most? Let us know.